Some people actually brought fancy luggage to the retreat (see last entry), but I thought it would be more trendy to show up with a backpack of mental and emotional burdens. My load seems so heavy lately with the things God has appointed for me in this season. Some days, even though I try hard to walk in His strength, I feel so alone, afraid, and weak. This was all in my backpack. On the second day, our leader directed us into the Benedictine discipline of "silence and solitude" for three hours. Frankly, I was SO EXCITED about three whole hours with nothing to do but feast on God. No writing deadlines looming, no projects threatening to devour, no backpack weighing me down. Just a balmy, carefree, surfers delight kind of California afternoon, spent in a beautiful garden on a scenic hillside with Jesus. Walking about &frac12; mile to the edge of a cliff, I discovered a vacant gazebo and plopped down with my prayer journal, silently soaking in the sun as I wrote out a nice long chatty letter to Jesus. For once in a long time, I wasn't putting any requests before Him, just enjoying Him in coveted luxury. After awhile, I began to sing worship songs with abandon, hopeful not to elicit any dog-howling on the opposing hillsides. I also hoped no one was listening, but I didn't think about that too much. Then it came to my attention. Someone was listening. 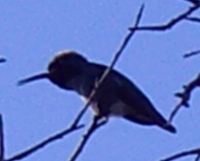 As I sang the words to "Draw Me Closer," I heard the sweetest voice joining in overhead, and looked up to see a hummingbird perched on a branch, singing his heart out, too. I stopped, worried I'd scare him off. But when I stopped, he stopped singing too. So I started singing again. He started singing again too. We played this silly game for at least &frac12; hour—him singing when I sang and stopping when I stopped. 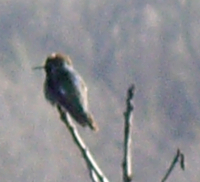 I'd never heard a hummingbird actually sing before, so it was the cutest thing. His presence was so welcome…and somehow reassuring. When I figured I'd stayed there long enough, I worked my way down a prayer path and ended up near a big cross set in the hillside. I sat down underneath it and began to sing again. No sooner had I gotten into the song, than…guess who showed up belting out his harmonic bird praises. It was a very special moment, communing with God through His creation, feeling once again very reassured of His presence. Two other times during the weekend, God delivered a very timely and specific message to me on the same topic of aloneness through two different individuals. These people do not know each other and did not conspire to give me exactly the same message. It was definitely God. The message: Julie, you are not on the outside looking in. With God, you are on the inside looking out. You are one with Father and His Son. To some people, that message would seem strange and maybe indiscernible or confusing. For me, it was life and peace. I often feel like I'm on the outside looking in. I feel very alone, powerless, and discouraged. God delivered an intimate message to me (and it is the same for you) that we as His children are never on the outside looking in. We are in His very person, looking out through His eyes, His heart, and His strength. All three of these messages were consistent with each other. I am not alone. I am not operating in my own strength, therefore I am powerful in Him to do the work He has called me to do. I pray today you find encouragement as I did through the voice of a hummingbird—as one on the inside looking out. Hello, I attempted to e mail you relating to this particular article but cannot get in touch with you. If you please e-mail me anytime get a minute. Regards. Thanks so much for writing a lot of this awesome info! Looking forward to seeintg more blogs! Excellent post. I was checking continuously this blog and I am impressed! Extremely useful info particularly the last part :) I care for such information much. I was seeking this certain info for a long time. Thank you and best of luck. Hey there I am so delighted I found your website, I really found you by error, while I was searching on Google for something else, Anyhow I am here now and would just like to say thanks a lot for a remarkable post and a all round enjoyable blog (I also love the theme/design), I don’t have time to read through it all at the moment but I have saved it and also added your RSS feeds, so when I have time I will be back to read a lot more, Please do keep up the fantastic work.